Died today at 90. He was one of those behind the scenes players like Tony Tedesco, Don Randi and Carol Kaye who had a huge hand in the popularization of rock music in the 60's. During his career, he played 40 #1 singles and on 150 songs that made the Top 10. He was easily the most prolific drummer in the history of popular music. IIRC (and I may not) in the documentary about the wrecking crew both Blaine and Carole Kaye say they started out wanting to be jazz musicians but couldn't make a living at it. A drum master unknown to most .... R.I.P .. He's hardwired into American Popular music. He started out as a jazz drummer, and even went on the road with Basie. When he came to LA, Shelly Manne was the top studio drummer, and Shelly turned down all the rock dates he was called for, because he thought they were beneath him, and gave them to Hal. Next thing you know, Hal played on every hit record of that time. In the 80's, drum machines took over the studio scene, and HB wasn't as busy as he used to be. His sixth wife took everything he had in a bitter divorce, and HB would've been broke if not for his Union pension. I promise not to hold this against him. We all have our crosses to bear. 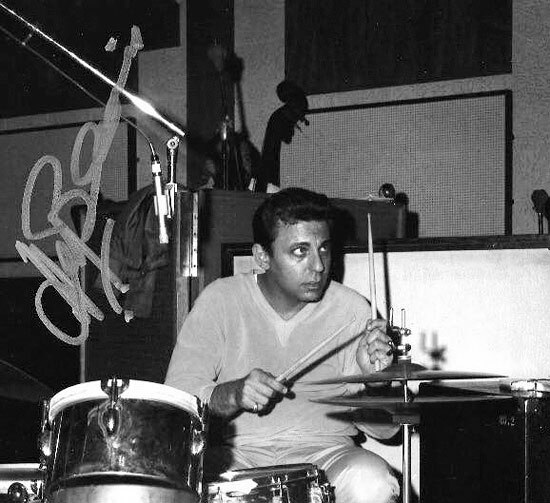 RIP Hal Blaine! I'd say that in my lifetime, he was the country's #2 self-promoter, behind only Stan Lee. He often bragged that he was on more Billboard #1 hits than anyone else, but I don't think he should be remembered for that. I think that he should be remembered as the drummer on The Tijuana Brass's "A Taste of Honey." It was Herb Alpert's idea for the group to just stop briefly, and he told Blaine to just think of something to fill in the space. I'd say that that and Ron Wilson's Wipeout solo were the two most famous drum solo's of the decade. Yeah, I think Shelly kind of regretted not getting into that circle like Earl and Hal. He called up Hal and asked him why he was getting so many more calls than he was getting. Is he the most-recorded drummer ever? I'e heard it's about 6,000 recordings. I imagine some jazz guys would at least give him a run for money. Billy Higgins? I think I read that Earl Palmer played on even more records. Actually, Wikipedia says about 6,000 singles and about 35,000 total tracks. That would seem hard to top.